Actually I was supposed to publish this review last month, but sorry I delayed this review for a quite long time, since I was too busy.. *cough* watching a lot of K-dramas at the same time lol *slapped*. Ugh I feel guilty now, I am truly madly deeply sorry! Ah okay let's back to the main topic! So I re-dyed my hair last month with a hair dye product from a super famous Japanese brand, Palty! Hello everyone! Happy Sunday to all of you ^^ Today I am back with another false lashes review, kindly sponsored by KKCenterHK. You can also read my previous review about the first set that I got from them HERE! Annyeong! 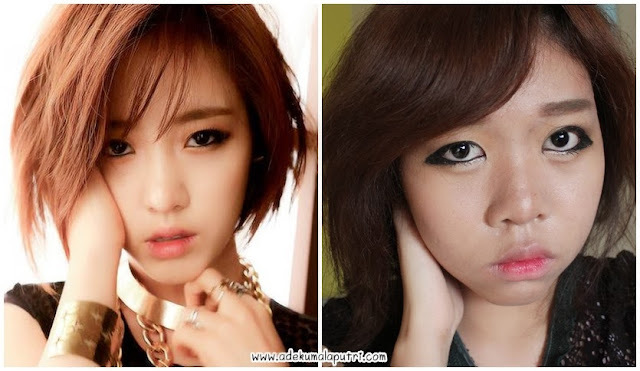 Today I am back with a new K-pop inspired makeup tutorial, and this makeup look is inspired by Eunjung from T-ara's new music video "Number 9". Well, I received my October edition beauty box from Lolabox yesterday. Thanks a lot! Hello everyone! So, KKCenterHK kindly sent me two different designs of their false lashes collection, and today I am going to post a quick review about these handmade false lashes in A513. Today I will announce the lucky winner of my giveaway sponsored by MOTTA! Yay!